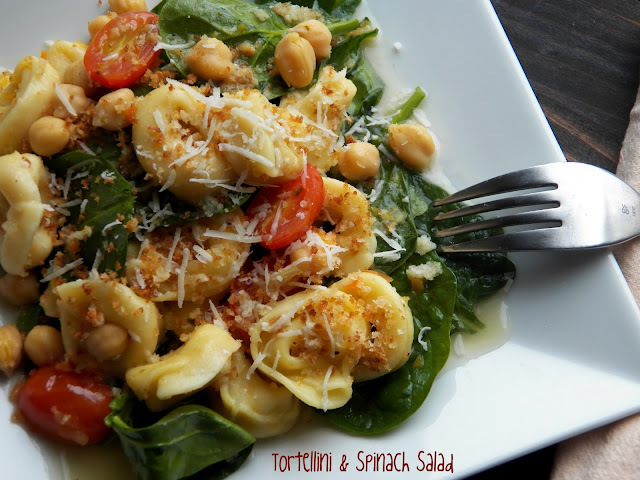 Soup, salad and pasta - in one bowl! Warm broth ladled over the fresh spinach just wilts it slightly, just enough to still call it a salad. Cook pasta in a large pot of boiling salted water according to package directions; drain and set aside. While pasta is cooking, saute onion, carrot, garlic, oregano and red pepper flakes in 2 Tbsp. olive oil in a large saute pan over medium low heat, until carrots and onion are slightly softened, about 5 minutes. Stir in broth, wine and lemon juice; bring to a boil. Add pasta, beans, and tomatoes; simmer to heat through. Season with salt and pepper to taste. Toast crumbs in 1 Tbsp. oil in a small skillet over medium heat until golden, stirring often. Toss with lemon zest and season with salt and pepper. Place 1 cup spinach in bowl or plate. Top with broth, pasta, breadcrumbs and Parmesan. Looks great! I'd love to try it by switching the chicken broth w/ vegetable broth to make this a vegetarian meal. Thanks for sharing! Ein tolles Gericht. Stelle ich mir schon sehr lecker vor.